Strength in unity was the prevailing theme at the 24th National Equine Forum, held in London on 3rd March. Government officials, vets, trainers, charities and industry leaders all concurred that working collectively and communicating effectively can achieve so much more for the health and welfare of the horse and the future of equestrianism in the UK. 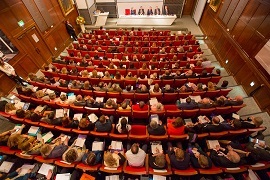 A full house of more than 200 of the country’s most prominent members of the equestrian industry, including NEF President HRH The Princess Royal and George Eustice MP Minister of State for Farming, Food and the Marine Environment, benefited from diverse and candid presentations and discussions. The common entreaty throughout the day was for everyone to pull together to secure a safe and healthy future for equestrianism. The event included a pictorial tribute to NEF’s former Vice President and Honorary Fellow Richard Matson, who passed away at the end of last year, as well as the presentation of the Sir Colin Spedding Award to inspirational riding school proprietor Sue Martin. To allay concern over the new non-statutory status of Code of Practice for the Welfare of Horses he suggested it would have advantages for horse welfare as it should be easier and quicker to update. Proposals for the animal establishments licensing system meanwhile aimed to rationalise the process by helping local authorities concentrate on higher risk establishments while exempting low risk businesses that are on accredited lists. Jan Rogers Head of Equine Development, BEF showed how the ‘new database for a new era’ was progressing in line with many recommendations made by the equine sector in response to the 2013 surveys but that enforcement still remained a challenge and that working together was imperative. Pamela Thompson, Head of EU Team, Animal Health Policy and Implementation, Defra explained how the EU Regulation changes should update and simplify existing legislation. The ‘Smarter rules for safer foods’ should strengthen standards along the whole agri-food chain. The format of last year’s Chief Veterinary Officer (CVO) panel discussion was repeated very successfully this year, debating priorities on equine health and welfare in a changing world. Roly Owers, Chief Executive of World Horse Welfare, chaired the panel, which comprised Nigel Gibbens CBE CVO for the UK, Robert Huey CVO for Northern Ireland, Sheila Voas, CVO for Scotland and Steven Gale, Animal Health and Welfare Officer for Stockton on Tees Borough Council. A wide variety of questions were covered during the hour, and not surprisingly equine identification featured heavily, with the overriding consensus being that an effective traceability system was crucial in order to manage disease risk. Dr Richard Newton, Head of Epidemiology and Disease Surveillance at the Animal Health Trust, expanded on the changing nature of the equine disease threat facing the UK, in the Inaugural Memorial Lecture. He emphasised the growing risk of cross-species transmission of diseases such as influenza and Hendra virus, a changing global ecology for insect vector borne diseases such as West Nile virus and African Horse Sickness and a re-emergence of old and previously presumed conquered diseases such a Dourine, Glanders and Swamp Fever. He advised that recognising and understanding these threats are key to their prevention and effective control. The lively afternoon sessions presented essential advice on the role of the professional and the importance of knowing the animal you are dealing with. Ben Hart, Donkey Behaviour Training Manager at The Donkey Sanctuary explained why understanding behaviour is the new frontier of equine welfare and how donkey behaviour should never be interpreted on a horse scale. Dr Peter Webbon, Chair UK Equine Sector Council for Health and Welfare and Veterinary Advisor for the International Studbook Committee, continued the theme of understanding the animal, discussing the use of genetic criteria to made decisions about breeding, purchase or management. Professor Derek Knottenbelt, Consultant in Equine Internal Medicine at the University of Glasgow emphasised why horse owners should always consult the professional in the event of illness or accident so as not to risk their horse’s health. “Do unto your horse as you would do to yourself”, he said. In one of the brief topical spots Professor Celia Marr, Editor of the Equine Veterinary Journal and Chairman of the Veterinary Advisory Committee of the Horserace Betting Levy Board, looked at the Thoroughbred industry’s significant contribution to the nation’s equine health and how the sport and general horse populations must take action to help fund future research. In a separate session Jenny Hall, Chief Veterinary Officer for the British Horseracing Authority went on to discuss how and why the horse always comes first in racing. Other topical spots embraced the importance of communication in equestrianism. Tony Tyler, Deputy Chief Executive of World Horse Welfare discussed the matter of proportion when it comes to riding. The increasing incidence of weight mismatches between horse and rider needed effective communication to divert the potential welfare issue of riders weighing more than the recommended 10-15% of their horse’s bodyweight. The next topical speaker Natasha Adkinson, International Para Dressage Athlete on the BEF World Class Podium Potential Programme, demonstrated how social media could be harnessed to best effect to communicate messages in a connected way to engage and generate important support for equestrian sport. Dan Hughes, Equestrian Performance Director at the BEF discussed the challenges of this year’s Rio Olympic and Paralympic Games from equine and human health and welfare to care of owners. He reiterated the importance of social media in helping equestrianism maintain its place in future Olympic Games, emphasising the importance of working together to inspire the next generation. This led neatly on to Pip Kirkby, Chief Executive of The Pony Club who discussed the new look and feel of the organisation and how strength of communication would underpin success in helping to enthuse and encourage the next generation of riders. The day was rounded off with HRH The Princess Royal presenting the Sir Colin Spedding Award to Sue Martin BHSII, proprietor of Trent Park Equestrian Centre in London, in recognition of her unstinting efforts to improve equestrian learning and training. The two finalists Walter Gilbey, represented by his wife Jennifer, and Baroness Ann Mallalieu were presented with certificates. A summary of some of the NEF presentations can be downloaded from www.nationalequineforum.com . The 2017 National Equine Forum will be held on Thursday 2nd March at the Institution of Mechanical Engineers, One Birdcage Walk, Westminster, London.